The Wild West certainly earned its moniker. Nonfiction books and documentaries about 19th-century gunslingers are a reminder that truth is often stranger than – and just as dramatic as – fiction. A few gunslingers may have been good guy heroes. Many were probably complex characters who did both good and bad things. And a few were simply rotten to the core. Curly Bill Brosius easily fell into the latter category. Here’s an excerpt from my romantic adventure novel, The Skeleton Canyon Treasure, that discusses this real historical figure. My main characters, Camie and Ryan, are hunting for Ryan’s uncle, who disappeared while hunting for the historical Skeleton Canyon Treasure. They follow clues to a museum he visited and meet Jennifer, a local historian. Here she shares some tidbits about one of the gang members from the story of the lost treasure. “I hate when that happens,” Camie murmured. Ryan shot her an amused glance. Ryan and Camie both sat up straighter and exchanged a glance. “That’s what makes history so interesting,” Jennifer said. Ryan gave a grunt she couldn’t interpret. What was he really looking for? History and legend so often intertwine. And in the American Southwest, legends often involve treasures. Lost treasures, buried treasures, treasure maps – anything to do with treasure. On my blog, I've reviewed several nonfiction books about treasures in the Southwest. I've also written three adventure novels about women hunting for treasure, with the help of strong men. But have I searched for lost treasure myself? While it is tempting – at least I'd get to explore the wilderness – the chance of success seems too slim. I have visited historic sites such as Tombstone, as shown in these photos. And when hiking, it doesn't hurt to keep an eye out for interesting surprises. Beyond that, I'd rather read and write about treasure hunting adventures. Camille Dagneau – beautiful, brilliant, and prickly – isn’t quick to trust, especially when a strange man has broken into her machine shop at night. Ryan MacAllister insists he’s merely looking for his missing uncle, who has disappeared while hunting for a lost treasure. He believes Camie is the key to finding the treasure, and his uncle. Camie can ignore the attraction she feels, but she won’t pass up the chance for an adventure. 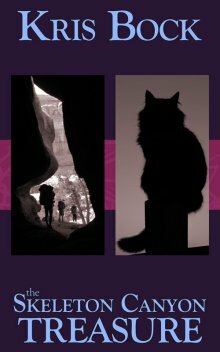 Following the clues in the missing man’s journal will take Camie, Ryan, and the feisty cat Tiger on a trail through the Southwest. They’ll face steep cliffs, twisty tunnels, and worse dangers in human form, but trusting each other may be the biggest challenge. And they’re running out of time….